The first ever baseball ground in Sri Lanka and also in South Asia constructed with funds provided by the Government of Japan under its Grant Assistance for Cultural Grassroots Projects (GCGP) will be inaugurated by His Excellency President Mahinda Rajapaksa at the Mahinda Rajapaksa International Sports Complex in Diyagama, Homagama on Sunday 23rd December 2012. The Government of Japan has provided a sum of US$ 111,607 (approximately Rs.12 million) of grant assistance along with US$ 136,400 (approximately Rs.14 million) of JICA donation fund to the Mahinda Rajapaksa Sports Development Foundation for the “Project for the Construction of a Baseball Ground for Youth Training”. The inauguration ceremony will be followed by a friendly baseball match between the Sri Lanka baseball team and the Kanagawa High School Baseball Federation Team from Japan. Japan, as a country where baseball is very popular, has supported the promotion of baseball in Sri Lanka since 2002 by assigning Japan Overseas Cooperation Volunteers (JOCV) as coaches to the Sri Lanka Amateur Baseball/Softball Association (SLABSA), resulting in its gaining popularity in Sri Lanka. Successive Japanese baseball coaches have worked hard during the past decade to enhance the baseball skills among an increasing number of youth who have taken a liking to this sport. Accordingly, Sri Lankan baseball has now reached the level of international competition, ranked 32nd amongst 72 countries in 2011 and has already brought honour to the country by winning the third place in the Asian Cup Championship in Thailand in 2009 as well as securing the second place at the SAARC Baseball Championship in Pakistan in 2011. 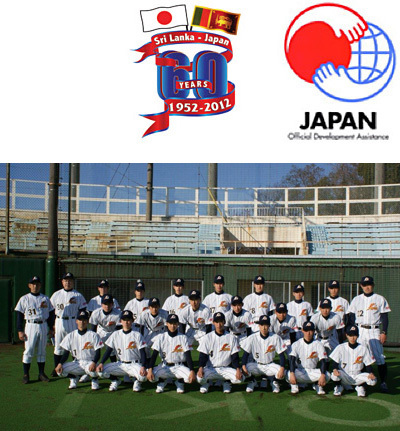 In addition, the University Student’s Baseball team had also qualified for the World University Baseball Championship in 2010 while the Under 18 team gained 5th place in the 2011 Youth Baseball Championship in Japan. However, owing to the lack of facilities such as the need for a suitable baseball ground for proper training, Sri Lankan baseball has not been able to reach the highest level of the game. Commenting on the project, Ambassador Nobuhito Hobo said, “It is significant that the inauguration of the baseball ground coincides with the 60th anniversary of diplomatic relations while Japan’s support for baseball in Sri Lanka commenced in 2002 the year Japan and Sri Lanka marked the 50th anniversary of diplomatic relations. This project would contribute significantly to further enhancing the cultural relations between the two countries”.